If you’ve enjoyed Zoë’s hints and tips for free here, you can also purchase her book, packed with loads more exercises and in-depth descriptions - a beautifully presented treat for yourself or a flute-playing friend! 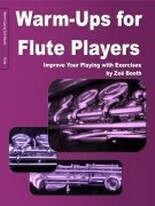 Welcome to my flute-playing free Hints and Tips Page; a new page is posted here on the first day of each month. I hope that October has been brilliant for practising, further to all the tips posted here last month! I know that there is a lot of hard work going on out there towards the next Flutes at the Barns themed Flute Day this month; the focus is "Free Your Playing" and playing away from the music stand - for many people their first time doing so - will be the aim, so send your good wishes for their bravery and success! It will be a fantastic day to pick up lots of tips and inspiration, watch out for the photos after the day! - where many notes are long, some composers use staccatos to show that one single note isn't; occasionally the staccato indicates an accent - not as hard an accent as the > or ^ but an accent nonetheless. Some of these indications counter one another, so it's up to you and I to use our judgement as to what sounds stylish and musical, taking the score as a starting-point. Listening to other instruments is really helpful in calibrating your personal style-o-meter, and - in particular - watching the many varieties of string bowing can inspire sounds which we can helpfully see and, later, aim to recreate. There are lots of places to read about crisp staccato-playing, so let's practice a more subtle stroke now; imagine the bassoon playing rounded, short notes - that's what we're going for. The tongue is needed, but if everything is left to the "tu" or "ti" the front of the note will be less than subtle, so we need to develop an approach which achieves the note reliably (and makes it short) without the tonguing - we can then add gentle tonguing as the final polish. For each of these exercises, practise the notes without tonguing (huffing) until you can achieve the notes cleanly and without accent. As the register and/or dynamic changes, more or less support will be needed - you ears will guide you. Once everything is clean, the tongue can be re-introduced, but the smallest of movement and most subtle "t" syllable only. Voila - subtle staccatos, perfect for Mozart! Next Time, December 2018: Seasonal Cheer!